It was while competing in the inaugural Invictus Games held in London in 2014 that Samual Maraldo first entertained the idea of going to university. In conversations with competitors from around the world, he learnt that many veterans had found a new lease of life through higher education. Six months on, when Sam was medically discharged from the Royal Australian Navy after 7 years of service, he realised he needed to find a new career path. ‘I was getting the shakes in my hands, so I could no longer do the technical electronics work I’d done in the navy, and I couldn’t return to my previous career as a chef because I couldn’t stand for long periods,’ Sam said. Sam decided to get qualified for the next chapter of his life. He turned to the Universities Admissions Centre (UAC) and was pleased to find that due to his navy rank as an Able Seaman, he was eligible for a wide range of courses at many of UAC’s participating institutions. 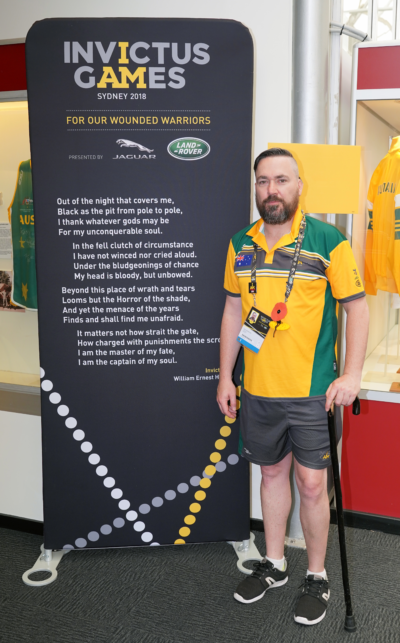 This year Sam scaled back his study commitments to fit in training for the Invictus Games in Sydney. He represented Australia in sitting volleyball, his team winning against France 2-1 and losing admirably to Poland. When the Invictus Games draw to a close tomorrow, many competitors may be left wondering: what’s next for me? The UNSW Veterans Scholarship is aimed at providing tangible financial support to student veterans studying a degree at UNSW, to help ease the cost of studying and remove one of the main barriers veterans face in accessing higher education. Charles Sturt University’s (CSU) Experience Matters Entry Program provides a range of options for veterans. CSU also offers generous credit packages based on military ranks that can help veterans get university qualified sooner. The Australian Student Veterans Association (ASVA) provides support, mentorship, and a collaborative voice to the student veterans of Australia. ASVA has established thirty chapters at universities in every Australian state and territory to provide a peer network for veterans on campus. Australian Catholic University and Western Sydney University are currently developing pathway programs for veterans to facilitate their entry into university – keep an eye on their websites for updates. Are you a veteran who’s wondering what’s next for you? Get in touch with UAC on 1300 275 822 (02 9752 0200 from mobiles). We’re here to help.